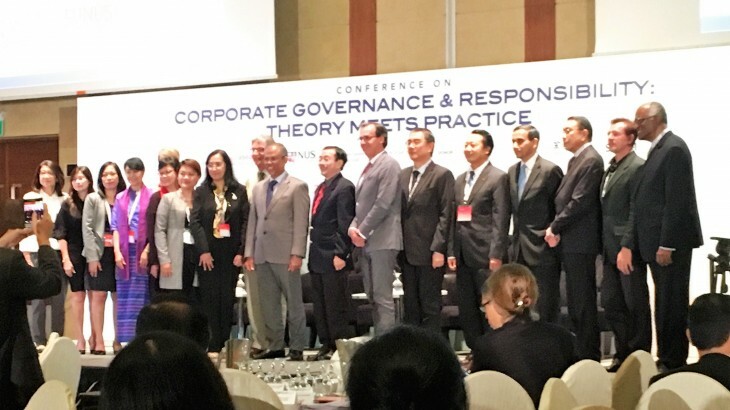 22 July 2016—On 20 to 22 July 2016, the ASEAN CSR Network (ACN) and the Centre for Governance, Institutions and Organisations, NUS Business School (CGIO) hosted a “Conference on Corporate Governance & Responsibility: Theory Meets Practice” in Singapore. In her welcoming remarks, Ms. Yanti Triwadiantini, Chair of ACN, commended the adoption of the ASEAN Guidelines for Corporate Social Responsibility (CSR) on Labour during the 24th ASEAN Labour Ministers Meeting convened on 15 May 2016 in Vientiane, Lao PDR. Ms. Triwadiantini reminded participants of the important role of business, emphasizing that they are the primary engine to alleviate poverty and are expected to contribute in meeting the region’s challenges. CSR, she highlighted, is not merely engaging in charitable activities. The Guest of Honour, Mr. Masagos Zulkifli, Minister for the Environment and Water Resources, Singapore, noted current trends wherein governments are realizing their shrinking role and resources while, at the same time, investors are increasing pressure on corporate entities to act responsibly. He particularly emphasized the need for companies to adopt a total approach and to aim to achieve sustainability from a holistic conception, encompassing both social and economic considerations. For this endeavor to take root and lead to benefits, it should be pervasive and embedded in corporate culture and management processes. He also stressed the importance of corporate disclosure so that stakeholders are able to appreciate efforts within the business institutions. His Excellency Sven Håkan Oskar Jevrell, Ambassador Extraordinary and Plenipotentiary of Sweden to Brunei and Singapore, during his opening remarks shared the latest endeavours of Sweden in regards business and human rights. In August 2015, Sweden launched its Action Plan for Business and Human Rights. The expectation, according to Mr Håkan Jevrell, is for Swedish businesses to act responsibly in and out of the country. He stated that Sweden is preparing to require disclosure of more than 200 companies. Thereafter, Ms. Rhodora Babaran, Director for Human Development at the ASEAN Socio-Cultural Community Department, ASEAN Secretariat, gave the keynote address on behalf of H.E. Dr. Vongthep Arthakaivalvatee, Deputy Secretary-General of the ASEAN Socio-Cultural Community. She highlighted the increasing importance of ASEAN in the global economy, with foreign direct investment (FDI) into the region steadily rising. She then noted worldwide trends in regards CSR and sustainability, with companies now expected to be and increasingly held accountable for their social and environmental impacts. The UN Sustainable Development Goals call for private sector engagement. International standards and guidelines concerning business conduct, such as the ISO 26000 and Global Reporting Initiative, are now becoming the norm. ASEAN, in keeping pace with this global movement, has made provisions in regards CSR in its ASEAN Community Blueprints. Recently, Ms. Babaran noted, the ASEAN Guidelines for Corporate Social Responsibility (CSR) on Labour has been adopted. The Guidelines serve as a guide for governments, enterprises and establishments, employers’ and workers’ organisations to raise awareness of labour issues among enterprises and incorporate CSR, human rights and decent work into their business practices. At the conference, the findings of ACN’s latest studies were presented. Prof. Lawrence Loh Director of the CGIO, gave the findings of the Sustainability Reporting Study in ASEAN, while Mr. Jerry Bernas, Programme Director of ACN, gave a presentation on Business Integrity Study in ASEAN. All, Business & Human Rights, News, Singapore. permalink.